Welcome to this week’s JustRite Challenge. All of the Stamp Simply girls are playing today and we hope you can play along with us and at the same time have a chance at winning a fun prize package with a value of $100, sponsored byJustRite and The Stamp Simply Ribbon Store. This week’s challenge is Love is in the Air, asking us to create a project reflecting love. Check out the full details and post your entries at the JustRite Blog. The Stamp Simply Ribbon Store carries the full JustRite line and is fully stocked with all new product in both the original ribbed and cling versions as well as dies. All products used on todays project are in stock and available. 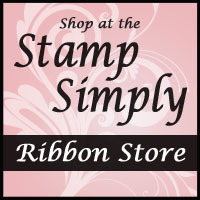 To order from the Stamp Simply Ribbon Store just send me an email at ssj@up.net, along with your state/zip or country, and I’ll get an invoice out to you. 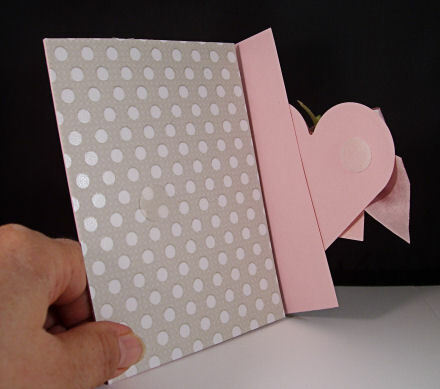 This is a pocket valentine, but it would also make a great gift card holder for a wedding or similar event. I used paper from Kaisercraft’s After Five, a tiny tag sentiment from JustRite’s Happy Everything Tag Kit (which includes appropriately sized dies), and an inside sentiment fromJustRite’s Nested Wedding Set. This is standad A2 size. 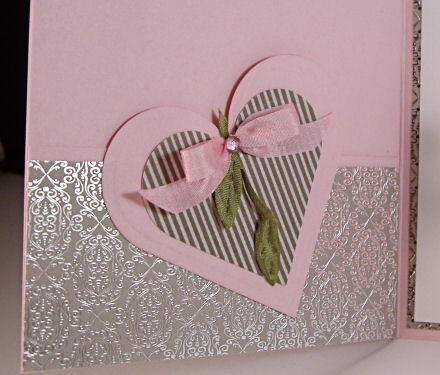 The focal image heart is cut with my Spellbinders Classic Heart dies. May Arts Pink Silk Ribbon was used for the bow, made on the Bow Easy. I used Satin String Leaves and Prima Fairytale Roses in Orchid to adorn the bow. My perfectly sized Happy Valentine’s Day sentiment is one of 18 mini sentiments included in JustRite’s Happy Everything Tag Kit,and the dies (made for JustRite by Spellbinders) included in the Kit were used to cut my small tag — PERFECT! The Stampin’ Up! Pink Pirouette paper is a perfect match to my May Arts Pink Silk Ribbon. 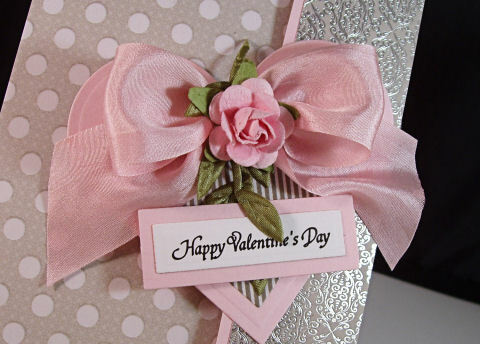 GLUE: I get alot of emails asking what glue I use to adhere the bows/roses. I’m using Aleene’s Clear Gel Tacky Glue. It’s about $1.59 for a large 4 oz bottle from Wal-Mart or similar stores with craft sections. This has replaced my previous glue preference, which was Aleene’s Fast Grab Tacky Glue, which is no longer available in my area — maybe it was discontinued, I’m not sure. I’m very pleased with the Clear Gel Tacky Glue. It is clear, dries clear and squirts out of the bottle VERY easily (a HUGE plus). It is wetter, thinner and more slippery than my previous glue — that just means I have to hold my bow or roses down for a few seconds longer for them to start to “grab” — but once adhered, they are very tightly secured. Drying time is a bit longer, too. I am very generous in using my glue. Hope that helps! Just hoping you can see how I’ve attached the heart to the front side flap and can you see the Velcro Dot used to hold the card closed? It’s kind of hard to see the clear dot on the dotted paper, but it’s there! Velcro is still my favorite closure for these type of cards. Here’s the card opened. That is a pocket on the left side to insert some goodies — cash, check, or tickets for some romantic or fun event! The beautifully scripted and perfect Valentine sentiment on the card inside is one of nine sentiments included in JustRite’s Nested Wedding Sentiments. I like to use Versa Fine Onyx Black Ink for crisp, clear sentiments that are always easy to read. PLEASE NOTE: I WILL provide a template with scoring/cutting measurements for this style card holder. I just ran out of time today, so it’ll be my next post — please check back if interested. Using the Scor-It full sized score board makes this super quick and easy. And here’s a little peek at the smaller heart on the inside pocket. It’s adhered to the pocket front. The bow is 1/4″ Pink Silk and is made on the smallest legs of the Bow Easy. 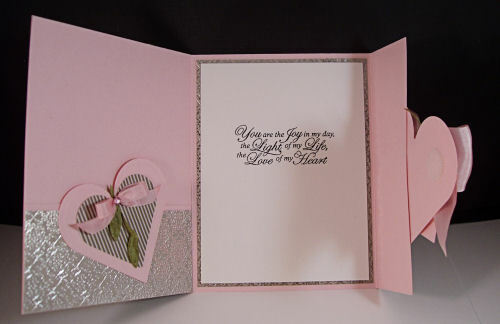 I added a Light Pink Kaisercraft Rhinestone and May Arts Satin String Leaves. 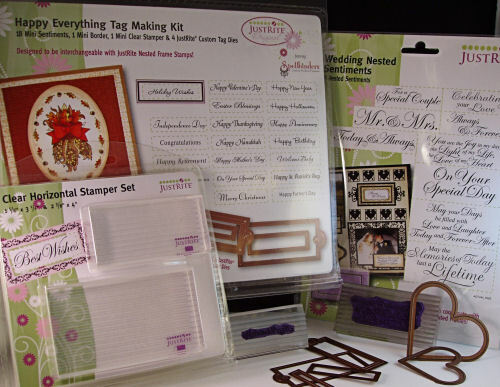 JustRite Happy Everything Tag Kit – $32.95 – Includes 18 mini sentiments, a mini border, a mini clear stamper and 4 tag dies made by Spellbinders for JustRite. An all-inclusive kit that’ll get years of use for every occasion! JustRite’s Wedding Nested Sentiments – $14.95 – Nine beautifully scripted sentiments perfect for weddings or any occasions of affection! JustRite Nested Frame Dies and Nested Sentiment Dies (not used today) are produced by Spellbinders especially to fit all the JustRite Nested Frame and Sentiment line of stamps – $24.95 each set. JustRite’s set of 2 Clear Rectangle Stampers – $23.95– are made to perfectly fit the series of JustRite Nested Frames and Nested Sentiment stamps, being clear to allow for perfect alignment. Spellbinders Classic Hearts – $24.99 – a long time favorite die set of mine. Six dies included. Simple lines, always lovely and classic! Now back to the challenge for today! The Stamp Simply girls have come up with some over-the-top fabulous projects to share, so please be sure to check them all out. And before we begin, I’d like to officially welcome a NEW Stamp Simply Desiger to our mix – Please Welcome Jerri Kay Jimenez! Many of you know her from her blog, A Touch of Grace. Jerri’s work is beyond compare — her attention to every little detail is amazing. It’ll be fun to see what SHE considers “stamping simply” LOL!!! Welcome, Jerri! So happy to have you! You’ll add a wonderful variety to our mix of talented Design Team Members! The actual Challenge and where you upload YOUR creation is at the JustRite Blog, so make that your first stop. Deb Saaranen -HAPPY BIRTHDAY, Deb! And since my blog store is under construction and portions of it aren’t working the best right now, I’ll include my usual list of links to help you find some things — PLEASE click the TABS above the Blog Header as well. JustRite Custom Dies by Spellbinders – perfect!!! It just doesn’t get any easier! To order any items just email me at ssj@up.net with your list and your state/zip OR country so I can calculate postage and I will get back to you with an invoice. Thanks! You can see all KITS here. You can view all ribbons available here. 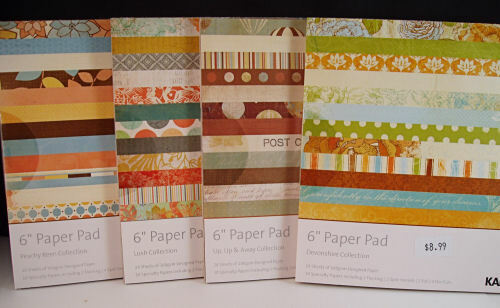 You can view individual paper pads, supplies and JustRite stamps here. You can view the first release of Just Rite Cling stamps in stock here. This link also includes some super sell-out prices of many JustRite sizes I will no longer restock. You can see the new JustRite Dies by Spellbinders on this post. You can view all tools used here. You can view Odds-N-Ends for sale here. You can see/read about the CLEAR BOXES here and here. You can view Verve stamps here. You can view Wordsworth stamps here. You can see all Penny Black Christmas stamps here. You can view Primas here. Thank you so much for stopping in today. Hope you enjoy the HOP and have time to enter the challenge over at the JustRite BLOG, giving you a chance at that FAB grand prize package!!! Have a GREAT weekend everyone. I’ll be back in a day or two with a template for today’s project. 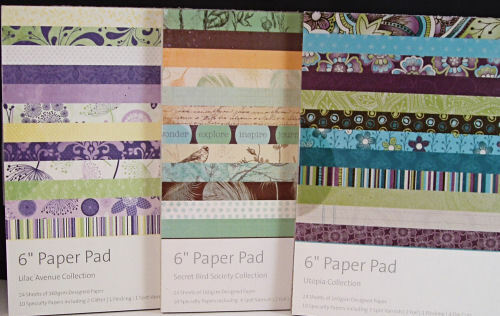 LOVE your paper mix here Sharon…so romantic and pretty! And the heart/blossom trim…wow! Oh my! Such a romantic card, Sharon ðŸ™‚ This one sure does whisper of love! Absolutely stunning Sharon! I knew it would be, I love it! Holy Cow!!! What a great bunch of goodies!!! I love the stamps from Just Rite! I need some more! Thanks for sharing. Oh, what a BEAUTIFUL card!! The paper is out of this world, the silk ribbon is to die for and the striped paper takes it over the top for me. I feel some shopping coming on, again, LOL. TFS. Just beautiful! I love those Kaiser papers. Everything is so over the top beautiful!! Gorgeous card and design-love the papers. Love the beauty of your Pink Card. It is so pretty. WOW lots of goodies again. I know I will enjoy all the designs, it is such a great talented team. Thanks. Sharon, your cards always are so beautiful.. all the right touches! Beautiful card…thanks too for the tutorial about the glue/velcro…I will have to give that a try! I just struggled with a gate fold and my solution was WAY harder than yours…LOL! Gorgeous, Sharon! Love the shimmery papers and the way this opens and can hold a gift card! A lovely card, Sharon! I love having the inside pocket to add a personal, handwritten love note to your sweety, or gift card, dinner or movie tickets, etc. Very sweet! Thank you for sharing your inspiration and talent! Lovely, lovely valentine! Sweetness to you! Beyond beautiful! Every detail is perfection! Great Valentine, Sharon! This is so very beautiful, Sharon…and I love how it opens!! Another beautiful card! I can see it as being a wedding card too – or even other themes – just gorgeous! Beautiful card, gives a warm feeling. This is the kind of card that you keep forever and your grandchildren find it. They love it too. Very pretty card! Like the choice of paper and of course ribbon! Love the card!! Just ordered the stamp set – Waiting for the tutorial so I can make a similar one. Oh wow this is so gorgeous! I love this fold and with the extra pocket it is wonderful. 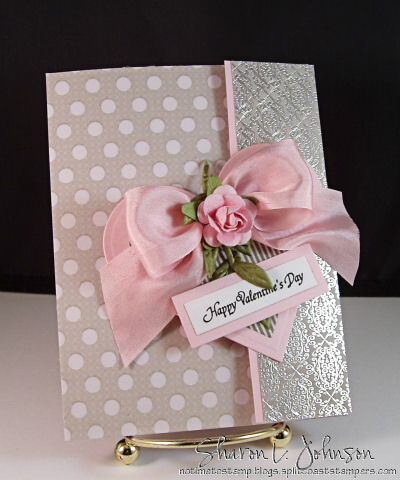 Also love the pink and silver and that absolutely gorgeous bow/ribbon. OMG Sharon: A friend told me about your website, I just went on and I LOVE IT. Your cards are gorgeous!!!! 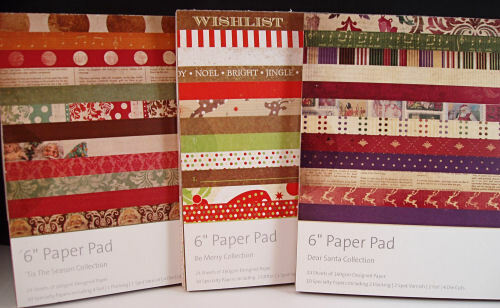 Do you still have the Kaisercrafts After 5 paper in stock? 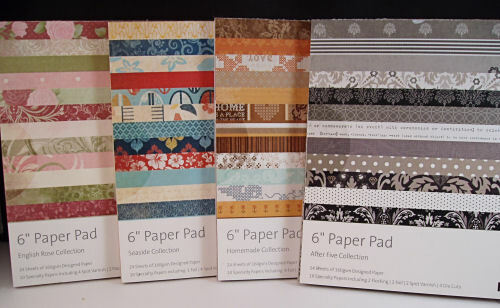 I haven’t seen the Kaisercraft paper in our stores. I bought some of the JustRite stamps at a convention I went to. Of course, they are still unopened and in mint condition. After seeing your cards, I am inspired to use them. I love the gate fold that you did. Thank you for a great site.